Between wedding gifts and the holidays, we’ve recently acquired a few really cool things – cookbooks, housewares, and assorted other gadgets worth telling you about. This is not our usual blog fare, but after the umpteenth time of telling Shane “wow, I really love _________”, I figured it’d be worth the occasional mention here. In that spirit, I would like to introduce you to what we call “Spaceship”. Shane picked this guy up when he was in Philadelphia in November, and it’s safe to say that our cats are obsessed with it. If you go anywhere near Spaceship or the canister of treats, Basil starts dancing around on his tippy-toes, chirping and shaking his tail with excitement. Basically, Spaceship is the best thing since sliced bread – or, for Basil, kibble. So what’s the big deal? 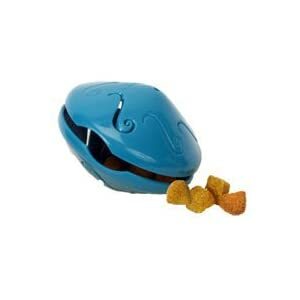 Basically, Spaceship – or, more properly the FunKitty Twist N Treat – is a treat-dispensing toy. You screw the two halves apart, add a handful of treats, and then screw the halves back together so that treats fall out when the cats play with it. Low tech, but effective! Basil’s strategy for retrieving treats seems to involve a solid smack and drag on the top of Spaceship, which, if he’s lucky, results in a treat popping out in his direction. Mina – usually the first to figure out any possible way to get more food – doesn’t seem to have figured out how it works. Instead, she monitors Basil’s play, waiting to skim off any treats that Basil misses. So I ask you – who is the smarter cat? The one who figured it out, or the one who figured out how to avoid work? Holy crap that looks awesome. I may have to get one for Walter and Teddy.